I’m buying a bike today! I have two Cannondale Synapse 7s on hold at two different Sports Basements in San Francisco. The Presidio Sports Basement has a white version that I’d prefer over the black style at the Bryant Sports Basement – I’ve been waiting until today to buy the white bike after scoping it this weekend because someone else had it on hold. As of last night, the hold ended, and now I’m ready to buy my first road bike! Photos to come after the deal has been sealed tonight. As you’re aware, Jesse and I are registered for the Wildflower Olympic distance triathlon in May and Vineman half Ironman in July. One minor detail: I don’t have a bike. I’ve been ready to take the plunge and invest in a bike for months now, but the fire wasn’t lit under me to buy a bike until this weekend. Jesse told me about an amazing 20% off coupon at Sports Basement just for signing up for the newsletter, the Basement Buzz. Intrigued but pessimistic about exceptions to this 20% price reducation deal, Jesse and I went bike shopping on Saturday only to find a perfect beginner’s road bike with a sales tag of $800. Because this bike is a 2013 model and not a 2014 model, it is included in the 20% off deal. I’m buying what seems to be a perfect bike for logging hundreds of miles for next year’s triathlon training cycle. I’ll definitely be joining Jesse on longer rides on the weekends when there’s light out (the winter mornings and after-work hours will be too dark to go biking in Marin). I’m stoked to add long rides to my workout regimen. Paradise Loop, here I come! 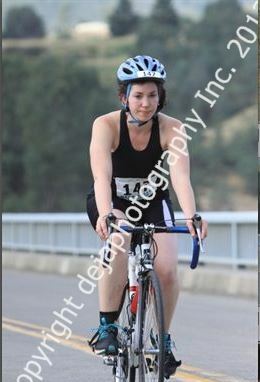 No more miserable race photos will be taken on my pretty new bike! Ah, that new bike smell! Enjoy!